NYTimes: Wouldn’t You Like Some Tasty Spam? That’s right… Subscribe now to our TimesLimited service that will send you spam – after all spam is tasty, right? Everyone likes spam… How can you resist? 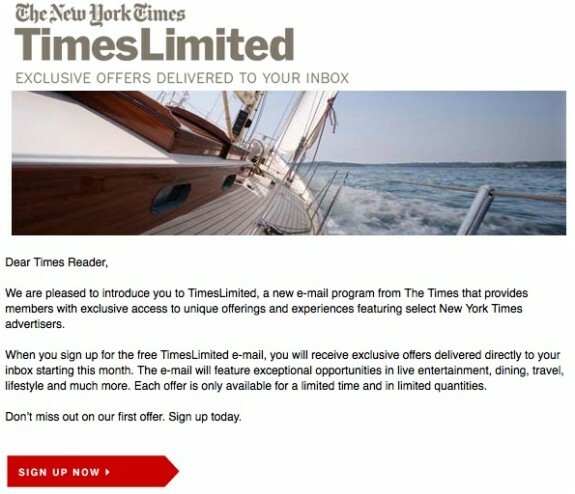 And the best part is that it’s a limited offer… Yeah, right… If receiving spam is limited to a special club membership – sounds like a good reason not to be part of the club. All in all – pretty funny. Dan here. A couple of years back, I bought Jay a universal remote for his birthday. Typical of our buying habits, I purchased the top of the line Logitech Harmony 890 universal remote for about $350 plus tax and shipping. I know it sounds quite extravagant for something so unnecessary, but I expected to only have to buy it once, until the technology changed. At the time, we were throwing frequent dinner parties, and since the radio frequency universal remote allowed us to change music on the stereo from any room in the house, I thought that this would be a wonderful gift that friends and family could enjoy. We have many electronic toys in our home, some for personal, some for professional use. Over the years, we have had the opportunity to try multiple point-and-shoot cameras, one of the first semi-affordable digital SLR, a prosumer and now a pro HD video camera, HDTV, printers, scanners, many computers, iphone, ipod, wireless land phone, etc. One thing that has become very apparent in today’s electronic market is how things rarely break. Water damage seems to be the leading cause of electronic device breakage. From our experience, it’s never from everyday usage. We’ve ended up buying many new electronic products simply because the technology changed, not because the product stopped working. The initial setup of the Logitech Harmony remote was a bit confusing, but once Jay had it working, the experience was glorious. Glorious until the buttons stopped working. First you would have to push them very hard to get them to work, and eventually they would stop working altogether. This wouldn’t be such a problem, except it would happen to the buttons most used, particularly the volume button. What use is a remote if you still have to get up to adjust the volume on the TV or stereo? The first time this happened, it was still under warranty. So we did some testing, and they sent us a brand new one. The customer service professional said that as soon as the new device arrived, the warranty would start over, and we would have one year from receipt of the remote. So now the second Logitech Harmony universal remote has stopped working. And the customer service pro told me that it was now out of warranty. She said that the warranty in fact did not restart upon receiving the new one, and she asked whether I had that promise in writing. No, I didn’t ask for them to send it to me in writing. I expected that it was true because they said it was. Regardless of whether the warranty restarted or not, the Logitech Harmony universal remote broke again, in exactly the same manner. So Logitech is offering a 50% discount on the purchase of a new universal remote. Apparently they know on some level that their product is defective. But do they seriously think that I’m going to spend another $200 on a product that they don’t stand behind? Definitely not. If this post stops even one person from buying a Logitech Harmony universal remote, I feel that my $350 dollars was not completely wasted. Too bad Jay’s b-day present turned into such frustrations. I’ll chalk it up to product testing, so others don’t have to be robbed of their hard-earned bucks. I’ll let you know what brand of universal remote we try next.